Successful Kitepower training session for the Dutch Defence. 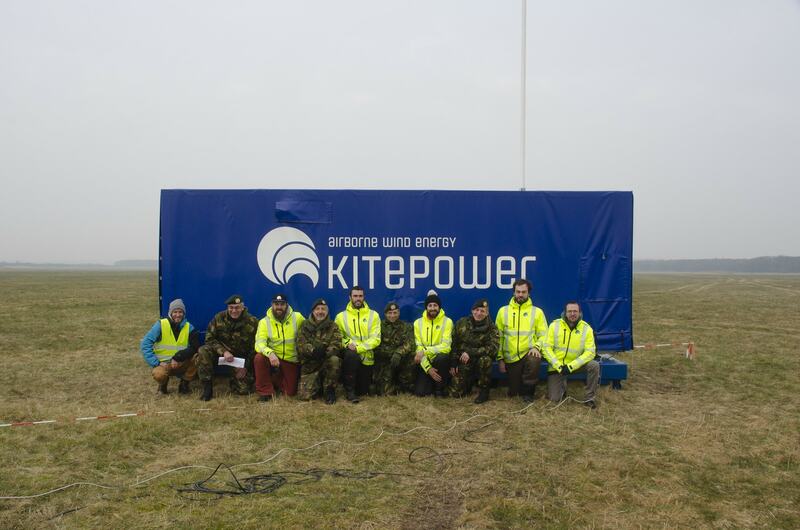 During the month of February 2018, Kitepower successfully performed a training session for the Dutch Defence in order to introduce the 100kW system and its operation. This training session was an important milestone of the ongoing Innovation Competition project endowed with 200.000€ that Kitepower won in November 2016 from with the Ministry of Defence. For Kitepower, the training was the first time an external third party successfully operated its 100kW unit currently in development. Over the course of four weeks, the Kitepower engineers showed four different teams of reservists and military engineers how to safely operate the system. The training included system deployment, a one-button launching procedure, supervision of automatic system operation, landing and system storage. With one afternoon of training, the teams managed to set up the system within one hour, operate the system and generate airborne wind electricity. In two occasions during the project, the airspace was shared with the airforce. 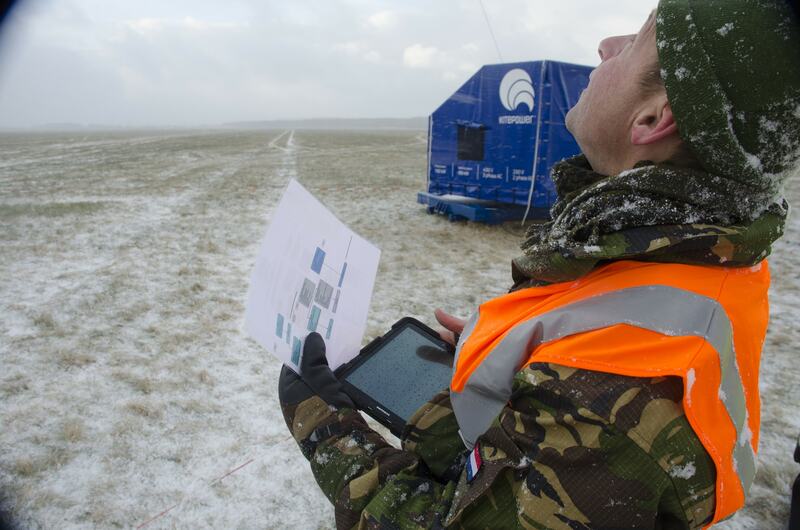 The test location at the Marnewaard in the Province of Groningen, Netherlands, provided a great testing environment and various in different weather conditions were experienced during the testings including heavy snow. We are proud to share this achievement of our engineering team with the public and thank the Ministry of Defence for its continuous support. In November 2016, Kitepower won the Innovation Competition themed „Energy for Military Operations (Energie voor Operationeel Optreden)“ of the Dutch Ministry of Defence endowed with 200.000€. The competition relates to the Operational Energy Strategy (Operationele Energiestrategie, OES-2015) of the Defence, in which it announces the ambition to produce 50% of the electricity in its camps in a renewable manner by 2030. During its operations on international peace missions the Defence is dependent on diesel for a large part of its energy supply, which brings risks and limitations. Reportedly, diesel prices can be as high as 6€/l (full burden of costs) driven by the need for regular transportation through difficult terrain to remote or challenging locations and its necessary security measures. Kitepower systems offer an environmentally friendly solution, by generating wind power with tethered kites. These units are easy to use and quick to install within a few hours in an operational environment. Kitepower systems can thus reduce diesel consumption and increase energy independence. Therefore, the jury of the Ministry of Defence chose the Delft startup and spin-off from the Delft University of Technology as the winner. Kitepower is a startup in airborne wind energy and spin-off from the Delft University of Technology located within the Aerospace Faculty. Since 2016, its dedicated team of engineers is developing a 100kW (nominal power) system that produces electricity from flying kites in higher altitudes. The system consists of three major components: A high-performance kite with an underneath steering robot (for automatic operation) which are connected through a cable to the ground station including a winch and an electric generator. The electricity is produced in two phases: First the kite is flown in a figure of eight across the wind to generate a high pulling force reeling out the line. When the maximum line length is reached, the kite’s profile is adjusted in order to glide back and reel the cable in with low force. Repeated in continuous cycles this results in a positive net energy output. Until the end of the year of 2018, Kitepower will continue its system development with the goal of establishing first permanent pilot installations of the first commercially produced units in the beginning of 2019.